Obscure Emily Brontë - A strange choice of favourites! I see now that there's a good reason so many enthusiastic readers pick up such odd impressions of Wuthering Heights. Emily Brontë has designed the book to achieve exactly that goal. That's why we start the book with Lockwood, someone who knows nothing and gets everything wrong. Brontë deliberately has him misidentify Heathcliff's relationship with both Hareton and Catherine II, which has the effect of rapidly multiplying the number of characters (ghost husbands and parents appear on every side). Because Lockwood is a fool, he makes it harder for the reader to keep everything straight. I think the changes in register have some of the same effect. The comic tone at the beginning is misleading and, like the confusion about the family relationships, makes it hard for the reader to know which details are important. All of them, sure, but let's not kid ourselves. That pile of dead rabbits should be pretty memorable, but it, like much of the beginning will inevitably become a blur once we launch into the main current of the story. Lockwood's dream in Chapter 3 is a good example of how this works. Everyone - everyone! - will remember Catherine's ghost at the window, when "my fingers closed on the fingers of a little, ice-cold hand!" But what about the page or two before, when the "famous Jabes Branderham" preaches sermons on the "Seventy Times Seven" sins, followed by a dream-battle in the dream-chapel. All of that stuff is part of the underlying imagery and themes of the novel, while Catherine is part of the plot, so any reader trying to figure out what the heck is going on with this crazy book latches onto Catherine's wrists and forgets the other stuff. What a confident writer Emily Brontë was. The basic story, the creation of Heathcliff and Catherine, and some of the most famous scenes are fine accomplishments on their own, so there are plenty of rewards for the first-time reader. But Wuthering Heights demands to be reread. I took my dingy volume by the scroop - a Wuthering Heights anniversary - Then there was a hubbub! "I could not bear the employment. I took my dingy volume by the scroop, and hurled it into the dog kennel, vowing I hated a good book. Heathcliff kicked his to the same place. Then there was a hubbub!" Ha ha! That's the stuff! * Those are, of course, the immortal words of Catherine Linton-Heathcliff-Earnshaw, ten years old** and already out of her gourd. They were also written by Emily Brontë in Chapter 3 of Wuthering Heights, an inspirational book. The internet is full of re-readings of Wuthering Heights - see Dorothy W. a few months ago for a high-level example, or Rohan Maitzen, who gets it all into one paragraph. "Not what I remember," that's the common refrain. It's not a romantic book, it turns out. Nor a sane one. I see here that Anna Quindlen has a novel with a scene where a therapist prescribes Wuthering Heights to a teenager for therapeutic purposes. I had not realized that Quindlen had written a thriller about a psychiatrist who gaslights her clients - I had always thought she was so nice. I myself find Wuthering Heights therapeutic, but that's because I think maniacal laughter is healthy. I have never seen a movie of Wuthering Heights, and I did not read it while an impressionable teen, so I will have to confess that the novel was just as I remembered it: funny, horrifying, original, clumsy in places, sublime in others. This week I'll celebrate a slightly late first anniversary of Wuthering Expectations by wallowing around in the Wuthering half. I don't have anything in particular to say about the book, but that won't stop me from enjoying a good roll in it, like the bulldog Skulker*** when he has found a particularly fragrant and enticing dead thing on the moor. P.S. I extend a special welcome to the omniscient Brontëblog, who will somehow make their way here by means of their mysterious internet voodoo. * More books are abused - kicked around, thrown in fires - in Wuthering Heights than in almost any book I can think of this side of Swift's The Battle of the Books. ** More or less. I didn't keep track that carefully, although Emily Brontë did. *** Note that it's the "normal" Lintons who have a bulldog named Skulker trained to bite little girls - "and look how Skulker has bitten her -- how her foot bleeds!" This is from Edgar and Catherine's "meet cute" scene - she's bit by a dog, he stands there and points at her. Tourmaline, or the Doorkeeper (1853) is hardly a favorite of mine, but it has a Modernist feel to it that is especially interesting, so I'll end my week of Stifter here. There is a couple with a daughter living in an apartment in Vienna. The man seems to be a gentleman of leisure with numerous hobbies. His room has as a grand piano, and two violins, and two flutes, and "a special work corner where he could cut up cardboard and make boxes, containers, lampshades, and other articles." Yes, that sounds like fun. Also, the "walls of the apartment were completely pasted over with portraits of famous men." The man has special couches and ladders made to allow optimal viewing of the portraits at all different heights. A famous actor, friend of this fellow, likes to come over and see the portraits; together, they look up information about the famous men in books. The actor begins, and ends, an affair with the wife. Later, the wife disappears. The husband searches for her, then he and his daughter disappear as well, abandoning the apartment. The narrator, a Stifter-like figure, tells us about all of the details of the landlord putting ads in the paper, and the city auctioning off the furniture. That is that, until, years later, "Stifter" meets a woman who happens to have met the father and daughter, and who assisted the daughter, who was mentally handicapped, after the father's death. And, again, that is that. What happened to the wife? Why did the man disappear? Why does any of this matter? "It [this story] is like a sad letter that tells us what extremity man may come when he dims the light of his reason, when he no longer understands life, when he abandons that inner law which is his steadfast guide along the right path, when he surrenders so utterly to the intensity of his joys and sorrows, loses his foothold, and is lost in regions of experience which for the rest of us are almost wholly shrouded in mystery." The story, the behavior of the characters, remains shrouded in mystery. Stifter gives us pieces, and even views from different angles, but the center is missing, deliberately. The opening words: "Tourmaline is a dark stone, and this is a very dark story"; the last: "the new generation has no knowledge of what stood there before them and of what took place there." Stifter will return to Wuthering Expectations in December, I predict, when I take a look at Rock Crystal. I know, he sounds like just the guy for a jolly Christmas story. And someday, I will read the long, slow Indian Summer, perhaps when I am convalescing. I would be remiss in not directing the reader's attention to this German-language Adalbert Stifter website. Note especially the map of Stifter sites on Der Adalbert-Stifter-Weg. Call your travel agent now. Adalbert Stifter's stories - all six that I've read, at least - feature eccentric bachelors and semi-bachelors. The priest in Limestone, the hypochondriac in The Forest Path, the gentleman farmer in Brigitta. In Tourmaline and Abdias, the recluses live with their daughters, but the wife is long gone. And The Recluse - there he is in the title*. Victor spends most of his time, and most of the story, exploring, with his dog, the house and monastery and island, and swimming in the lake. The uncle and nephew get along poorly at first, then worse, and finally better. "[N]o one can give real help, profound help, unless from time to time he can do a deed of force, like hurling a boulder. So if you started work now, the kind of work you could do would at best be work of no use to anyone, and yet it would slowly eat the life out of you. [O]ld age is a moth in the dusk, an uncanny thing flitting around our ears." There are several pages of this, some of which is more directly related to the story than this bit. This specific scene is one of the roots of Thomas Bernhard's novels. See his Gargoyles for an extremely close resemblance, if I'm remembering it correctly. It's sounds a bit like Nietzsche, too, doesn't it? The Recluse is my favorite of these Stifter stories, although I'm not entirely sure why. The blend, seems right, I guess. The mountain landscape is a continual presence in the story, and the descriptions of the mountains or atmospheric effects are generally quite good. The sweetness of the story is smartly balanced over a sort of unsettling sadness. * Pushkin Press will soon issue a new translation, titled The Bachelors. I read the David Luke translation, Limestone and Other Stories. The Hungarian steppes of Brigitta. The island on the mountain lake in The Recluse. The limestone hills of Limestone. The Saharan ruin followed by the charming Austrian valley (I didn't see that coming) of Abdias. Stifter's stories are all tied directly to a specific landscape. Even Tourmaline, set in a Viennese suburb, includes a lot of specific information about streets and buildings. Stifter treats apartments and houses with similar care - how are the rooms arranged, what is the furniture like? I don't want to claim that Stifter is an especially gifted nature writer. This passage is functional, and little more. There's a lot more where that came from. What goes on in these landscapes? Very little. I suggested last week that George Eliot risked tedium in spending so much of time establishing her setting, telling us about churning butter and carpentry. Stifter does not risk tedium - he seeks it out; he embraces it. The surveyor in Limestone relates to the priest (and to us), in the most persnickety detail, how he prepares his lunch and drink for his day's surveying. Here is the little bottle of ether which he adds to his thermos to keep his wine cold. The landowner in Brigitta takes his guest on a tour of his estate, showing him all of his important agricultural improvements. The lucky reader also get to take the tour. Abdias, come to think of it, also devotes a little more space than seems necessary to the topic of agricultural improvements. I don't think I'm exaggerating, but I should also emphasize the stories that are there. Abdias, which I wrote about here, has the forward momentum of a good folk tale. Brigitta has an attack by wolves, which is reasonably exciting. But here's The Forest Path: A young man, recently orphaned, now wealthy, becomes a neurotic and a hypochondriac. At a spa, he begins walking for his health. For ten pages of a fifty page story, our hero Tiburius is lost in the woods - see above. He falls in love with the forest, and is cured by exercise. Oh, and he meets a girl. They go strawberry picking. Events take their natural course. Eventually. The last sentence: "As I write this, news reaches me that the only sorrow, the only trouble, the only sadness that had clouded the marriage of Maria and Tiburius has been removed - his first child, a lusty crying boy, has been born." Tiburius's love affair with the forest is palpable, completely convincing. Henry David Thoreau might have written The Forest Path, if he wrote moralistic fiction, and were less original, and more of a sap. The marvels and delights of The Forest Path are small ones. I said on Monday that Stifter was humorless, which I think is very close to true. The Forest Path, though, is almost funny in places, and good-humored everywhere. After his parents' deaths, Tiburius begins collecting things: pipes and horses and "a collection of famous men whose heads, all in uniform black frames, he intended to decorate the whole building," and something I covet, "his reading desk, which could be screwed up and down so that when he had stood for long enough he could sit down," but he buys things so quickly that his house is mostly full of packing crates (p. 150) This gentle mockery is, as far as I can tell, a rare thing in Stifter. Those pictures of famous men show up again in Tourmaline. The Limestone priest's fine linens also appear in The Recluse. Odd, odd, odd. The description of the geography is developed in detail throughout the novella's fifty pages, to the extent that I was surprised to learn that this distinctive place is an invention of Stifter's. The semi-scientific descriptions of nature remind one of Goethe in The Italian Journey or Poetry and Truth, of his digressions on geology and drainage basins, of his insistence that he is not digressing at all, that understanding the geography of a place is the foundation of all true knowledge. Stifter agreed, even when the place is made up. He does this in every story. This would be a good place to insert Stifter's long passage about how thunderstorms form, but it's too boring. "[T]he air at ground level becomes so heated and so rarefied that the heavier air higher up subsides," etc., etc. If interested, see p. 213. There's a price to be paid for putting too much science in your fiction. The surveyor meets a self-denying, mysterious priest. His self-denial is mystery number one - he sleeps on a bench, with his Bible for a pillow, for example. Yet he owns, and wears, linens of the finest quality. Despite his obvious poverty, he has been robbed three times. Who lives on the second floor of the priest's house? Why does the priest entrust the surveyor with a copy of his will? Limestone is really the story of this priest, who is bascially a saint, a strange man, but a saint. He tells the surveyor about his childhood, the ruin of the family business, an early love affair, his life as a priest in a poor place. The novella ends after the priest's death, so there are no loose ends. Most of the mysteries turn out to be no such thing. This is a common Stifterian device - he gives equal emphasis to a large number of specific details, some important to the plot, some with symbolic value, and some nearly irrelevant. Another, ineffable mystery is revealed - how does this combination of the past, and the landscape, and the priest's own odd ideas, create the saint? That's the story, really. This is hardly a magical piece of prose writing. There's no metaphorical language until the very end. It's sincere, and undramatic. It's also quietly strange. That strangeness is the heart of Stifter. And it's about time. NYRB has re-published the old Marianne Moore and Elizabeth Mayer translation of Adalbert Stifter's Christmas novella Rock Crystal (1853), and the literary world has gone wild. Look, here's Adam Kirsch, reviewing Rock Crystal in the New York Sun. And here's Terry Vertigo, writing about a 1999 London edition. Well, it's more attention than Stifter usually gets. Adalbert Stifter wrote novellas, mostly, or long tales, or whatever they are. Dozens of them. They were often published in odd little periodical books called Tachenbücher, anthologies of stories, poems, and illustrations, mostly read by women. Bourgeois Austrians must have had interesting taste, because Stifter was fairly popular, and he's also fairly weird. Or so he seems now. I haven't actually read Rock Crystal yet. It's a Christmas story, so I'm saving it for Christmas. And I haven't dared the long novel Der Nachsommer (1857), translated both accurately and inaccurately as Indian Summer. Here's the Columbia Encyclopedia: "His late novels... are considered diffuse." I love the passive voice and the understatement. Over the last couple of weeks, I have read, actually re-read, what I think is everything else in English, the four novellas in the Penguin Brigitta and Other Tales (tr. Helen Watanabe-O'Kelly) and Limestone and Other Stories (tr. David Luke), which has three novellas, including The Recluse, my favorite. Irritatingly, the tale Limestone is in both books. I think Stifter actually has been receiving a little more attention over the last decade or so, due to the influence of W. G. Sebald. Sebald's novels were so original that many readers, including me, cast about for precedents. Adalbert Stifter was one of these literary life preservers. And Sebald gave me an entry into Stifter that was equally helpful. Last week, writing about George Eliot, I received an unusual number of useful and interesting comments, which I very much appreciate. I will squander that goodwill and fellow-feeling by spending this week with the dull and humorless Adalbert Stifter. Adam Bede has a plot, although I haven't bothered to mention it so far, mostly because I don't care much about it. But about two-thirds of the way through the novel, the story really kicks in and George Eliot gives us the best thing in the novel. I'm talking about two chapters out of fifty-five, twenty pages out of 560 in the edition I read. In the first of these chapters, Hetty, a pretty teenager, walks and hitchhikes from her country home to Windsor to join her lover Arthur, son of the local squire. The trip takes seven days and most of Hetty's money, plus she lied to her family and her fiancé - she was supposed to be visiting a friend somewhere else entirely. And Arthur turns out to be in Ireland. "[T]he good woman's eyes presently wandered to her [Hetty's] figure, which in her hurried dressing on her journey she had taken no pains to conceal; moreover, the stranger's eye detects what the familiar unsuspecting eye leaves unnoticed. 'Why, you're not very fit for travelling,' she said, glancing while she spoke at Hetty's ringless hand." Any reader of Walter Scott's The Heart of Midlothian will be reminded of another walk to Windsor, when Jeanie Dean walks from Edinburgh to Windsor to petition the Queen and save the life of her sister, soon to be hanged for the crime of infanticide. If he doesn't notice the resemblance now, he sure will in a chapter or two. Jeanie's walk is one of the great acts of female heroism in English literature. Hetty's walk is - well, something else. The next chapter is headed "The Journey of Despair." Hetty wanders around central England, purposeless, crushed. Eliot mostly stays pretty close to her. For the best pages - only five or six, I now realize - Eliot's method is really little different than Flaubert's. Close attention to detail, never too far from Hetty's own thoughts, Hetty's own language. Hetty gathers stones to drown herself, she becomes distracted by the rolls in her basket, she finds a shelter and dreams of the cold pond, and of her aunt. She resolves to get help from the friend she was supposed to visit in the first place. Eliot leaves her then, sort of suspended in her wandering. George Eliot was a person of almost shocking intellect, while Hetty is sort of stupid, a person of low cognitive abilities. The look into Hetty's internal life is completely convincing, a real achievement, possible only in fiction. Something much worse is around the corner for Hetty. Having read The Heart of Midlothian, I was pretty sure I knew what it was, and I was right. Eliot relates the rest of Hetty's story from a distance - through courtroom testimony, for example. We're never in her head again. I wonder why not. I have been getting stuck on the harvest party, near the end of Adam Bede. That party is actually a structural sequel to a remarkable long scene (7% of the novel) in the exact center of the book, Captain Arthur Donnithorne's 21st birthday party. Arthur is the son of the big local landowner, so the whole county is at the party, almost every character in the novel. Eliot describes everything. The food, the toasts, the dancing. There's a fine two or three pages devoted to the disappointment in her prize of the girl who wins the sack race. There's a sack race! And a donkey race. It's a good party. Lazy movie critics would say the scene is Altmanesque. The party is the climax of the first half of the novel. Not of the plot - up to this point there has hardly been any. Eliot spends 300 pages setting the scene. This is risky. She risks tedium. The girl and her prize is a good example. After winning an extremely undignified race, she wants something pretty, and is crushed to find that she's won a heavy winter robe and some flannel. This scene advances the crucial "young woman's vanity" theme, and ties it to a "forward motion" theme that won't be understood until later in the book. * The more I look at it, the more artful it seems. But the girl herself is a character of very little importance, and the scene does not move the plot by an inch. It's not exactly the case that nothing happens up to this point. Adam's father dies in a drunken accident early in the novel, and the love triangle that's the center of the main story begins to develop. But all of this is still part of normal life. The birthday party - now that's an extraordinary event. "It'll serve you to talk on, Hetty, when you're an old woman - how you danced wi' th' young squire the day he come o' age." Poor Hetty. What are the precedents for this novelistic use of a party? Balzac sets a lot of important scenes at parties and balls, but rarely spends any effort describing the party itself. The ball in Jane Austen's Emma is more what I'm thinking of. The list of later parties is much longer. Joyce surely knew Adam Bede - "The Dead" is a descendent of Eliot's party. Lampedusa might have known it, too - he was a demonic reader of English novels, and The Leopard has a classic party, more tightly tied to the structure of the novel than Eliot's. I wonder if Proust knew Eliot? Those endless parties of his. Talk about risking tedium! Risked, and achieved. * And she abandons her prize - she "throw[s] down the odious bundle under a tree"! If you haven't read the book, you won't know what I'm talking about. Tomorrow, maybe. "A grin of delight broke over Tom's face as the plate was set down before him, between his knife and fork, which he held erect, as if they had been sacred tapers. But the delight was too strong to continue smouldering in a grin--it burst out the next instant in a long-drawn"haw, haw!" followed by a sudden collapse into utter gravity, as the knife and fork darted down on the prey." Let's be tough on this passage. The first clause is pretty ordinary, and "a grin of delight" is weak, a cliché. But I can't argue with the second half. The "sacred tapers" are not meant seriously, but are sort of "mock sacred." The roast beef is a holy thing for Tom. The simile aids precision, as well. I picture the scene more accurately, just how the knife and fork are held, just where the plate is set. The next sentence is even better. The delight is smoldering, not the tapers, but the tapers create the association, make it seem almost logical. The delight smolders, then bursts, then collapses. Into "utter gravity," which sounds like a black hole. I don't know what this character looks like, but I can see his face in a way - the grin, the laugh, and then the serious business of eating. The great comedy, of course, is in the word "utter." I have great sympathy for any man who really enjoys his food, so I may be prejudiced. But this little passage is worthy of Dickens. Worthy of Flaubert. * This is Tom Tholer. In Chapter 4, five hundred pages ago, we heard of the death of a Bob Tholer. Eliot's keeping track of the details. How many great writers lack a sense of humor? Very few, I think. I'd pick out Ralph Waldo Emerson, Thomas Mann, let's see, Yukio Mishima. Feel free to suggest others. I can think of a much longer list of writers who do not get enough credit for their humor, and I was pleased to find that George Eliot belongs on the second list, not the first one. That's not just a sly observation, it's a bonafide joke, and a good one. A contemporary reader might be able to apply it to his own daily life. Perhaps to his own conversation. Ahem. That whole Harvest Supper chapter is quite funny. The farmers discuss the Napoleonic war, and the poor fighting prowess of Bony and his mounseers. Mr. Poyser suspects it's the result of eating too much salad, and not enough beef. Mr. Craig argues ("thumping the table rather fiercely") that when the French drafted a "big monkey," "you couldn't tell the monkey from the mounseers!" Although the book Adam Bede is often funny, the character Adam Bede is completely humorless. He argues that the story about the monkey, for example, is "all nonsense." Way to kill a joke, pal. Adam is good-humored, but is that ever not the same thing as having a sense of humor. He's the fellow who laughs along with a joke because he recognizes the form, not because he actually gets it. Come to think of it, none of the central characters - Hetty, Arthur, Dinah, God forbid - have much of a sense of humor. Well, they have their own business in the book. Mr. Craig, Mrs. Poyser, Adam's mother, and our narrator George Eliot - they provide the humorous undercurrent that keeps much of the book moving along. I was delighted to encounter this side of Eliot. George Eliot is at the "centre," F. R. Leavis tells me, in a Foreword included in the Signet Classics edition of Adam Bede, "of the creative achievement of the English language," and she "incites to pregnant reflections on vital continuity in art." What can this mean? Leavis wants to put Eliot in the middle of a literary tradition - Scott, Hawthorne, Eliot, James, Hardy, Lawrence. One leads to the next. I had never read any Eliot before taking on Adam Bede this summer. That list reminds me why. I had already picked up Leavis's idea from somewhere. Right, Hardy (ugh) and Lawrence (ugh, ugh)*. George Eliot was a proponent of Big Ideas, writing philosophical essays disguised as novels. Like Dostoevsky, or (shudder) Thomas Mann. Up against this tradition, I set Gustave Flaubert and his aesthete descendants, as does Leavis, interestingly enough. Madame Bovary was published three years before Adam Bede, Eliot's first novel, so she had no excuse for not writing a perfectly polished, elegant, and possibly hollow novel. Flaubert had shown the way. Come on, George Eliot, if that is your real name, get with the new thing. I express these opinions in imperfect ignorance, so no need to seriously argue with me - "you don't know what you're talking about" is sufficient to defeat me. Prof. Novel Reading was able to cajole the critbloggers at The Valve into hosting a long reading of Adam Bede this summer. Although I was unable to play along much, I owe them credit for, at the least, encouraging me to read the darn thing. This week, a few notes about what I found. No, it's not Flaubert, and why would I want it to be. * No objections, enthusiasm, even, for Hardy's poetry and a number of Lawrence's short stories. Or at least the narrator of the story White Nights (1848) is, at least for a while. He's a young social misfit, a St. Petersburg flaneur who has trouble meeting people. He comes across a sad young woman, instantly falls in love with her, and becomes blissfully happy. He tells his new lady friend all about his happiness in gushing multi-page paragraphs that are either the best thing in the story or competely unbearable. He compares himself to a tortoise, he tells her how he loses all his friends (through anxiety), he tells her how he wanders about the city. The oddest part is his description of his dreams about various Walter Scott heroines. Maybe we're not supposed to take this for what he actually says to the young lady. This story is in the anti-romance genre "We Can Still Be Friends," so the ecstatic state does not last. It ends pretty much where one is afraid it will. Still, this mood, this ecstatic state, seems to me to be an unusual thing to find in Dostoevsky - romantic happiness, especially. In 1849, soon after White Nights was published, Dostoevsky was accused of revolutionary activities and exiled to Siberia, where he remained, in prison and in the army, for a decade. When he returned, he had become a different writer, the warm and cuddly prankster we all adore. I find it hard not to read these early stories, whatever merits they might have on their own (considerable, especially regarding The Double), as repositories of clues about the later writer. Maybe one could argue with the repetition of "salve" and "conscience", but I think that's half the joke. "he told how Russia was hourly approaching perfection, and literature and learning were thriving; he told of an anecdote he had read lately in The Northern Bee; he told of an extraordinarily powerful boa constrictor in India; and lastly he spoke of Baron Brambeus. In brief, Mr. Golyadkin was perfectly happy." Dostoevsky has other modes in The Double, some good dream sequences, for example, and some good uncanny stuff, his own mix of Gogol's The Nose and his various German sources. Because some of Dostoevsky's later subject matter is sort of a laugh killer - patricide, axe murders - his comic talents are overlooked. The Double is funny. Maybe not as funny as The Metamorphosis or As I Lay Dying, but pretty funny. Poor Folks is, like many first novels, stuffed with other books. For example, right in the center of the novel the main character, a copy clerk, reads Gogol's The Overcoat and is, apparently, driven insane, because of his close resemblance to Gogol's clerk. Pushkin's Tales of Belkin, on the other hand, are healthy. All of this is strange enough, but in a novel that seems to be about a poor man and woman's struggles to get by in St. Petersburg, it's especially odd. The man even knows a novelist, and gives us samples of two of his works, Passion in Italy and Ermak and Zuleika. The excerpts are dreadful, clearly a parody of degenerate Russian versions of something, Walter Scott maybe. "In passing, I may say that Rataziaev is not only a supreme writer, but also a man of upright life - which is more than can be said for most writers." There are clearly some jokes here that are no longer accessible. The woman, Barbara, relates her first love, with a poor tutor (one of the title's many poor folk) who loves books more than life. In a truly pathetic passage, Barbara and the tutor's father find themselves at the same bookshop, looking for a gift for the son's birhtday. They settle on a complete Pushkin. The father buys one volume, the most he can afford; Barbara buys all the rest. "I accompanied the cortege only to the end of the street. Here the driver broke into a trot, and the old man started to run behind the hearse - sobbing loudly, but with the motion of his running ever and anon causing the sobs to quaver and become broken off. Next he lost his hat, the poor old fellow, yet would not stop to pick it up, even though the rain was beating upon his head, and a wind was rising and the sleet kept stinging and lashing his face. It seemed as though he was impervious to the cruel elements as he ran from one side of the hearse to the other - the skirts of his old greatcoat flapping about him like a pair of wings. From every pocket of the garment protruded books, while in his arms he carried a specially large volume, which he hugged closely to his breast. The passers-by uncovered their heads and crossed themselves as the cortege passed, and some of them, having done so, remained staring in amazement at the poor old man. Every now and then a book would slip from one of his pockets, and fall into the mud; whereupon somebody, stopping him, would direct his attention to his loss, and he would stop, pick up the book, and again set off after the hearse. At the corner of the street he was joined by a ragged old woman; and at length the hearse turned a corner, and became hidden from my eyes." Would this be much out of place in the work of Bruno Schulz, say, or Franz Kafka? I found it sort of shocking. It's like certain passages of Büchner or Stendhal - Modernism before the invention of Modernism. The passage is from the very end of Barbara's memoir, page 50and 51 of the Everyman Classics edition, translated by C. J. Hogarth. Fyodor Dostoevsky's first two novellas, Poor Folks (1845/ 1846) and The Double (1846), are full of surprises, at least to me. Poor Folks is - here's the first surprise - an epistolary novel, consisting of the letters between a copy clerk and his distant cousin, a younger woman. The cousins live in tenements across the street from each other, so the letters sometimes skip crucial parts of what action there is. Although poor themselves, both characters occasionally encounter truly desperate poor folks, but otherwise spend their time writing up their opinions of the books they have leant each other. The tag I put in the title is the clerk's description of one of his own letters. Incoherent? Yes, very much so. The short novel is overstuffed with ideas that are undeveloped but provocative. The Double is quite different, a single strong and coherent (if crazy) story. Mr. Golyadkin, another clerk, finds himself tormented, at work, at home, and in restaurants, by his exact double. The double is quick on his feet, a successful flatterer and schemer, while poor Golyadkin has trouble formlating coherent sentences, much less getting on in the world. What's worse, the double eats ten fish pies when Golyadkin eats only one, and then sticks Golyadkin with the bill. The reader of Dostoevsky who finds the pinnacle of his art in the Grand Inquisitor chapter of The Brothers Karamazov may find these novels to be a little thin. There are only hints of Dostoevsky the deep thinker, although the two clerks do seem like close relatives of the Underground Man - they're Dostoevsky characters, all right. I think both short novels are interesting in their own right. The Double, in particular, is even well-written. And both are essentially comic novels, showing a side of Dostoevsky's style that often seems to be overlooked. I'll spend the rest of the week poking at these books, to see what I can make of them. This is also posted at the Russian Reading Challenge, my last entry there. This poem is from Edward Lear's A Book of Nonsense (1846/1861). I pilfered the image from the remarkable nonsenselit.org, where all of Lear's nonsense is easily available. What's a person to make of a poem like this? There's hardly anything there. Context might help. The Penguin Book of English Verse contains three bits of nonsense (e.g., "There was an old man with a beard") stuffed between Robert Browning and Emily Brontë. No, that's not much help. Reading A Book of Nonsense as a whole increases the strangeness of the limericks. There are 112 of them, two to a page (so one sees four at a time), all with identical meter and rhymes, most, as we see here, repeating a place name for two of the three rhyme words. Each is accompanied by a cartoon, quality ranging from crude to pretty crude. Some readers might find this monotonous. In Lear's later nonsense books he includes more varied fare - for example "The Owl and the Pussycat" or the nonsense alphabets - as well as more limericks. But in A Book of Nonsense they just come at you. There's no relief. So what I mean is, it's a wonderful book. There is no "understand" here. Just delight, or shock, or misfiring synapses. Or something else, who knows? This is hardly even the best stanza. I could really go for a chocolate shrimp right now. Off to the mill! The Kabuki-za theater in central Tokyo is a good example of an institution that's both old and not so old. The theater dates to 1889, but the current building is actually the third incarnation. It's a surprising piece of traditional Japanese architecture in a neighborhood of neon and department stores. Kabuki itself goes back centuries, and has in some ways become museum theater. I saw a program of three pieces. The first, the classic Onna Shibaraku (Female Wait a Minute)*, is from the mid-18th century, and included the full panoply of costumes, makeup, and stylized speech, incomprehensible to most contemporary Japanese people. The second was a dance with music, of similar vintage. The third was a farce from 1926, with naturalistic sets, makeup, and acting. Except for the actor playing a corpse - he was caked in sickly yellow makeup. He was good, too - really good. The whole thing was surprisingly accessible, in part because the English audio guide not only translates the speeches, but explains everything - the actors playing the two brothers are brothers in real life, or the part of the stage hand is played by the most famour actor in the troupe. Only the first, classic Kabuki piece really needed much explanation. The farce, which mostly involved drinking and a dancing corpse, pretty much took care of itself. One great advantage of the Kabuki-za theater over American theater or opera is that food and drink are, for most theater-goers, a central part of the experience, and can be brought to your seat. The theater contained at least one sitdown restaurant, and a dozen snack stands. Bento boxes of sushi, bowls of soba noodles, tempura. A dazzling variety if sweets. 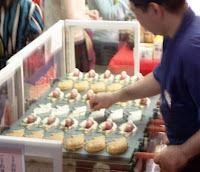 Fish-shaped waffles filled with sweet bean paste (see right). During the first intermission, almost everyone was eating. It was a beautiful thing to see. This may be my only tourist advice that is not obvious from a guidebook. When in Tokyo, do not miss a show at the Kabuki-za theater. And don't eat too much beforehand. * That's right, "Female Wait a Minute," a parody of the all-time Kabuki classic, "Wait a Minute." The Japan Lady Isabella Bird visited in 1878 is gone. One can visit it in books and pictures, but there's almost nothing else left. World War II was unbelievably destructive, but before that the 1923 earthquake, the 1868 Meiji restoration, and any number of other fires and earthquakes had demolished swathes of the country. Last winter I discussed my difficulties with the issue in Vienna* and Munich and Paris. Tokyo is even harder to think about - the Incurable Logophile mentioned this in a comment way back then. Almost everything in Tokyo is new, and even the old places are only old in certain respects. The Senso-ji Shrine in the Asakusa neighborhood, for example, dates from the 7th century. But the visitor won't find a scrap that old. Almost everything dates from the 1950s, or later. Actually, I think the two demon statues in the photo of the Treasure House Gate are pretty old. Not 7th century, though! 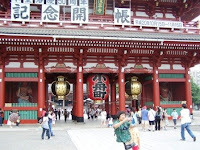 The Senso-ji Shrine is a functioning place of worship, visited by millions. It's kept freshly painted. Additions or changes are made every once in a while. It's not a museum. The visitor needs to mesh the history of the place with its current life. 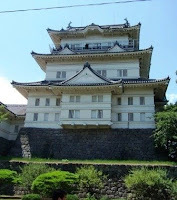 I visited a samurai castle in the small city of Odiwara that I knew, the instant I saw it, was a restoration. The culprit here was not the Americans but the Meiji emperor, tearing down the centers of samurai power in the 1870s. The current building dates from the 1950s, and only the outside was restored - inside it was a museum of historical artifacts, mostly regional samurai stuff. I'm not complaining. The world moves on. That's Yokohama Bay to the left - can you imagine Commodore Perry's black ships there, opening Japan to the outside world? I can't, not really. But I was looking for Japan's past, so I tried. * See praymont's series of posts on cafés in Vienna. He did his homework. Vienna has chosen to freeze parts of itself in the Belle Epoque - a fine choice! - and as a result a certain slice of the past is always with the visitor. Tokyo does not work that way. Isabella Bird's trip to Japan was a consequence, indirectly, of the outcome of a Japanese civil war. Although Bird was in Japan just ten years after the war of the Meiji Restoration, she almost never mentions, or presumably witnesses, any evidence of the war. The modernizers had won the war, Western scientists, traders, and tourists were allowed to troop around the country, and that was that. I put an ellipsis in a quotation yesterday that excised one of the few times she did mention the war. Why was the town of Shinjo so horrible, full of boot-gnawing rats and the like? Because it had been a daimyo town, the home of a local warlord. The Meiji administration had crushed the daimyos, pulled down their castles, and dispersed their samurai. So the castle towns had fallen into decay. In the last letter in Unbeaten Tracks in Japan, Bird has returned to Edo/ Tokyo, where she visits the suburb of Meguro, the very neighborhood where I lived for a month. The attraction, oddly, is a crematorium. It is hygienic and efficient, with high chimneys, so that "the people of the neighborhood never experience the least annoyance." The Governor of Tokyo insists on presenting Bird with a translated history of cremation in Japan. Reading this letter, I can hardly avoid imagining the entire neighborhood of Meguro as a crematorium. It was incinerated, every scrap of it, by American firebombing. Perhaps there was a monument somewhere, although I never found it. I worked and ate and shopped in Meguro, just like everyone else who works and lives there, without this sort of thing ever crossing my mind. Why would it? I'm making Unbeaten Tracks in Japan sound like a W. G. Sebald novel, which it is not. One of Sebald's gifts, though, was to transform material like Bird's book, to fit them into his own creative world. If you are actually writing a Japan-centered, Rings of Saturn-inspired novel, take a look at Bird and steal this idea from me. No one will ever know. I won't tell. I barely left Tokyo while in Japan, but I had Lady Isabella Bird's Unbeaten Tracks in Japan (1880) to show me some of the rest of the country. At least as it was in 1878, when Bird trooped around northern Japan, making her the first European woman to visit any number of spots. She was accompanied by a young interpreter, and otherwise hired horses and guides along the way, so she was never alone, but she was not relying on any other Europeans. Isabella Bird's story is typically Victorian only in its comedy. Sufferering from various health problems, especially back pain, her doctor recommended horseback riding. She complied by riding horses all over Colorado, Hawaii, Japan, and a substantial part of the continent of Asia. She had some money of her own, but her trips were mostly financed by her popular travel books. Bird's most famous book, by far, is A Lady's Life in the Rocky Mountains (1879), ironically about one of the least exotic places she ever went. I haven't read this one, yet, but I think it is not as much of a pure travelogue. * Unbeaten Tracks in Japan is limited by the format, letters to her sister Henrietta. It's a journal, basically. There's no real point to the Japan trip, except that she's doing it. There's some anthropology at the end, and some geologizing, but the journey is at least as interesting as the destination. Maybe this doesn't sound so funny on its own. I don't know, although I think ending with the cucumbers is the giveaway. Having spent some time with her, I sure that she's well aware that her misery is not really serious, is funny in retrospect. And it certainly does not keep her from mounting the next horse and moving forward, on and on and on, for the rest of her life. * It also includes her friendship or romance or whatever it was with an actual mountain man.